Tuesday, December 02, 2008 Posted by Stephanie H.
Today you will find a wide variety of outdoor products designed for any outdoor space. Arbors have served many purposes in our gardens by offering a place of shade and rest on a hot sunny day, acting as a strong climbing support for many vines, and serving as a separator between the outside world and our gardens. Just the act of walking under a well chosen arbor can help relieve the stresses of our busy lives. The arbor serves as a visible boundary between the noise and distractions of the world and the peace and tranquility of our gardens. A fence around your garden may be too restrictive in purpose and too harsh in look. In contrast, an arbor sets a boundary for your garden without breaking up the natural landscape. Of all the outdoor items available, arbors have one of the most interesting histories. Arbors have long been used to provide shade along a garden path. From the noblemen’s estate in medieval England to the grape vineries of modern day France, arbors were often seen overgrown with vines whose leaves provide shade from the sun and even protection from the rain. Arbors provide protection from nature while still allowing you to enjoy the many facets of its beauty. The need to find a perfect arbor can be easily satisfied with one of the wide variety of options that are available. Today there are many artistic styles of arbors and numerous materials they can be made of, such as: wood, steel, and vinyl. Wood Arbors provide the most traditional and natural feel. Steel Arbors offer a modern, exquisite man-made element to contrast with the natural beauty of a garden. Vinyl Arbors supply the traditional look of wood without the maintenance. One vinyl arbor that stands out is the Wellington Arbor. Designed in the tradition of renowned American architect Frank Lloyd Wright, the Wellington Arbor's use of right angles and straight beams speak of the Wright's clean style and his love of cantilevers. 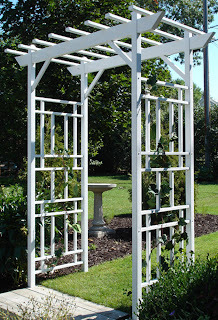 If planted with vines this arbor provides a symmetric and orderly contrast to their natural rambling. If not planted, the Wellington Arbors own beauty will be clearly highlighted. Either way, the Wellington Arbor will be a great addition to any garden. Many arbors come with an assortment of accessories. You may find that a simple arbor doesn’t have the commanding presence you are looking for. If that’s the case then adding wings or a gate to your arbor may strengthen its position in your garden.